Dor Rhúnen is a royal territory of Gondor encompassing a vast area including the Dagorlad, the Anduin valley north of Ithilien, and much of the Talath Harroch and southern Rhovanion. After Sauron's fall at the end of the Second Age, these lands were virtually empty; the Easterlings being unwilling to venture too close to the borders of Gondor, and the Dúnedain in that day having no use for lands so far removed from the kingdom proper. The settlement of Dor Rhúnen took off after King Turambar's victory over the Easterlings in III 541. It was Turambar who commissioned the first forts to be built on the Dagorlad and beyond to keep a vigil on the plains of southern Rhovanion and give warning of any new Easterling threats. The forts established in those days grew into towns, and the frontier was pushed further east so that new forts had to be built farther afield. By the 580's of the Third Age, a military governor had been appointed to organize the developing territory and a new capital was made at Thorondir (S. "Eagle's Watch"). In the mid-Third Age, Dor Rhúnen's development was spurred by the rise of trade across Rhovanion between Folyavuld, the Northmen of Burh Armenrik, the emerging Northmen of northern Rhovanion, and the cities of Gondor's southern provinces. The garrisons of the border forts grew as Gondor realized new interest in the markets of Rhûn, and trade routes connecting these widely separated markets became established. The Ehwathrumi Northman tribes hired on to guard trade caravans from predatory bands of Easterlings who again made their presence felt in Rhovanion. Dor Rhúnen's power and influence crested in III 1248, when Minalcar the Regent of Gondor and his Northman ally Vidugavia campaigned across Rhovanion and deep into Rhûn to rid the land of Easterlings. Trade flourished as never before, and towns such as Thorondir, Rhûnost, and Gobel Gwindor on the Dagorlad became important hubs on the most popular routes of trade. A contingent of Dúnedain even garrisoned a fort in the town of Burh Armenrik for a time, marking the farthest east Dor Rhúnen's authority was ever extended. 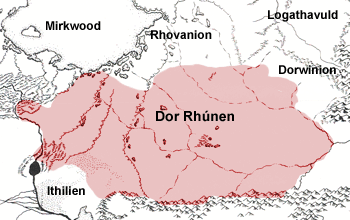 Since that day, Dor Rhúnen has been on a steady decline because of a number of factors. Gondor's Kin-strife turned the Dúnedain upon one another, and the many of the frontier soldiers whose presence made Dor Rhúnen safe returned home to take part in the struggle. Eldacar's return to the throne in III 1447 employed a great portion of the strength of Vidugavia's realm, leaving no one to keep watch over the plains of Rhovanion. Sensing the lowering of Gondor's guard, Easterlings again found there way into Rhovanion. Then in III 1636, Dor Rhúnen was dealt a felling blow by the Great Plague. Gondor, more than any other realm in Middle-earth felt the full ravages of the Plague. Garrisons have been reduced by half, and the towns of the frontier are left mostly vacant. Those few townsfolk who escaped the black death have returned to their families in Gondor. Without the support of the towns around the forts of Dor Rhúnen, the garrisons again have become dependent on tenuous lines of supply. The Northmen too have been decimated by the Plague, and have withdrawn within their homesteads and settlements. In their place, Easterling tribes such as the Asdriags have again returned to the lands of southern Rhovanion to raid the caravans of those few merchants who still dare to chance a crossing of the wild plains. Thorondir, Rhûnost, and the fortress-towns of the Dagorlad are all viable markets in Dor Rhúnen. These towns lie on the main routes between the urban centers of Gondor and the trade centers of Rhûn and Rhovanion. As such, nearly every commodity that passes between the two regions may be found in the market. Many of Rhûn's merchants sell their goods here, rather than making the trip into Gondor itself, for the profits are very good in these towns, and there is customarily a healthy population of Gondorian merchants to deal with, who make their living transporting goods to the markets of their homeland. In addition, the merchants of these towns will normally have the goods that Rhûn's merchants seek to purchase from the southern cities. Surrounded by the plains of Rhovanion and the Talath Harroch, these towns always offer good prices for fresh fruits and vegetables, as well as grains. Livestock and its by-products are abundant, as they are in many of the surrounding markets, and little profit can be made in that trade.